Now that my whole family has started using smartphones, we’re sending a lot more sound files, photos and videos to each other than ever before. Texting is still ideal in plenty of situations, but we’ve learned that multimedia tends to be a more efficient and fun way to send information. Getting a short video clip of the dog is a lot more enjoyable than getting a short text about him, right? If video messaging really is going to be a future trend, then the video conferencing experts at Skype want a piece of that pie. 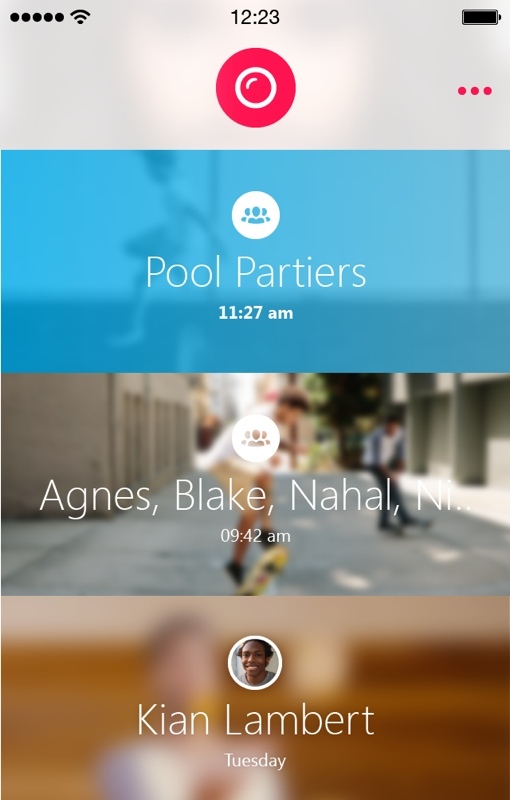 Today, the company is re-introducing Skype Qik, a video-messaging app for iOS, Android and Windows Phone devices. It allows you to communicate with friends – or groups of friends – through the use of recorded clips up to 40 seconds in length. Skype Qik stores the eight most recent video messages of each conversation in a chronological “film strip.” Unlike with iMessage, you control who sees what – sent videos can be deleted from all recipients’ phones at any time, or you can simply let them expire 2 weeks later. You can also save up to 12 pre-recorded messages to your phone, allowing you to quickly respond to incoming messages when you can't record your own on the spot. Messages can be sent through the Qik app using the receiver’s cellphone number as an address. If the person does not yet have the Qik app, they’ll receive a text message urging them to download it so they can view the content. I don’t care much for that spammy aspect of the app. It’s much better tech etiquette to talk your friends into downloading the Qik app before you start sending them messages with it. If you’d like to give the new Skype Qik app a try, head over to your favorite app store and give it a download, as it's completely separate from the existing Skype app. You’ll also need to round up the family and get them to download it too. After all, Qik is pretty useless if you’re the only one that’s using it. Or, of course, you can send videos to friends and family through iMessage, Facebook Messenger, Snapchat, Kik and the myriad other mobile messaging apps available.